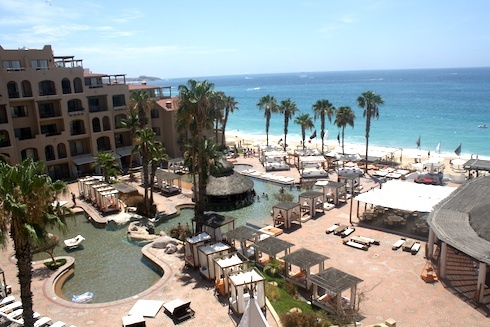 Nikki Beach, located at the ME Hotel in Cabo San Lucas, is a great place to enjoy a cocktail and have a good time. With delicious sushi, DJ Music, swim up bar and their famous beds, Nikki Beach Cabo San Lucas is the place to see and be seen – you might even catch a celebrity or two. Not only is Nikki Beach a unique place to hang out by the water, it also throws tons of parties and has fantastic DJs. 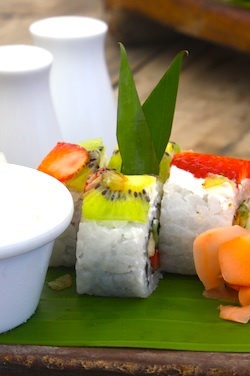 One of my favorite things on the menu is their fruit rolls – delicious bananas, kiwis, and strawberries with cream cheese rolled up in a traditional sushi roll. For this week’s recipe I went for a matching yummy fruit drink – Nikki Beach’s delicious Banana Margarita. I hope you all enjoy this fruity Cabo Cocktail! Place all ingredients in a blender with ice. Blend well and serve in a martini glass. What’s your favorite drink in Cabo?